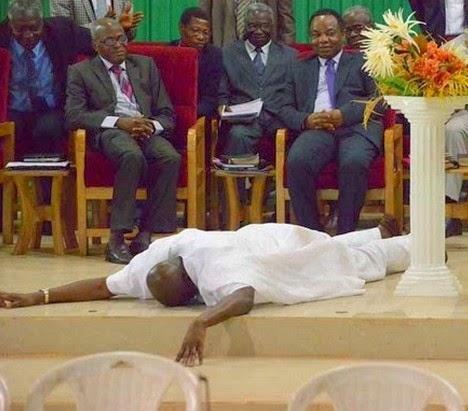 Photospeak;Newly appointed Ekiti Governor Fayose prostrates at thanksgiving service says GOD gave him a second chance..
Hmmmm.. somebody say D-R-A-M-A! with all due respect your excellency being given a second chance has nothing to do with being a governor for a second time..you contested and you won people who can talk about second chances are people who survive near death experiences,who survive hard and trying times and Triumph! They fight cancer they beat it!,they fight ebola they beat it!,They fight from life changing injuries and stand up and walk again! Those are the people with the second chance tales..